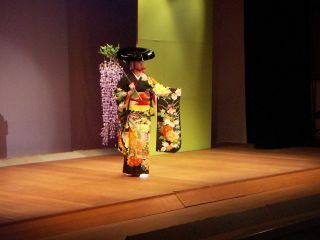 Naoko's Journal: Japanese traditional dance! I had a job today. I made an announcement at a backstage of a Japanese traditional dance event in Ikeda city. All of the dancers performed excellently! I met the head teacher more than 15 years ago, and since then, I've been doing the job every year. I'll show you a photo of one of the dancers!